Statistics show that men are much more likely to experience hair loss at some point in their lives than women are. Although hair loss in men is commonplace, it does not make it any less embarrassing or disheartening for the person experiencing in. Losing one’s hair can really knock your confidence and make you feel an array of emotions that can lead you to feeling quite depressed about the whole thing. Many men choose to hide their hair loss for as long as possible before looking for a solution, such as hair loss surgery. However, hair loss doesn’t need to be a reason to hide away when the solution is a quick and easy procedure which can give you back a full, healthy head of hair. Whilst both men and women can experience hair loss, it tends to be more noticeable in men. This is due to the fact that men and women lose their hair in very different ways. Here we’ll examine why hair loss appears to be more common in men than women. Permanent hair loss affects 70% of men and 40% of women in their lifetimes. That’s quite a difference between the two genders but when you see the reasons behind it, it makes a lot more sense. Basically, men are more prone to a condition known as androgenic alopecia. This is a genetically inherited condition, often referred to as male-pattern baldness, and it starts with hair loss starting at the temples and receding back in to the characteristic “M” shape. Hair is also lost at the crown in most cases too. The condition increases activity of the androgen receptors in the hair follicles. These receptors respond to androgens like dihydrotestosterone (DHT), a by-product of testosterone that shrinks hair follicles and makes it hard for them to live. Because men are constantly producing testosterone throughout their lives, they are also constantly making DHT, and so it makes them more likely to lose their hair than women, who do not have a similar genetic disposition to hair loss. Some men experience hair loss in their teens and early twenties, which again is usually a result of hormones. Since the hormones are raging in puberty, it makes some men in their teens and early twenties more at risk of losing their hair as testosterone is produced in a higher quantity during puberty than any other time of a man’s life. 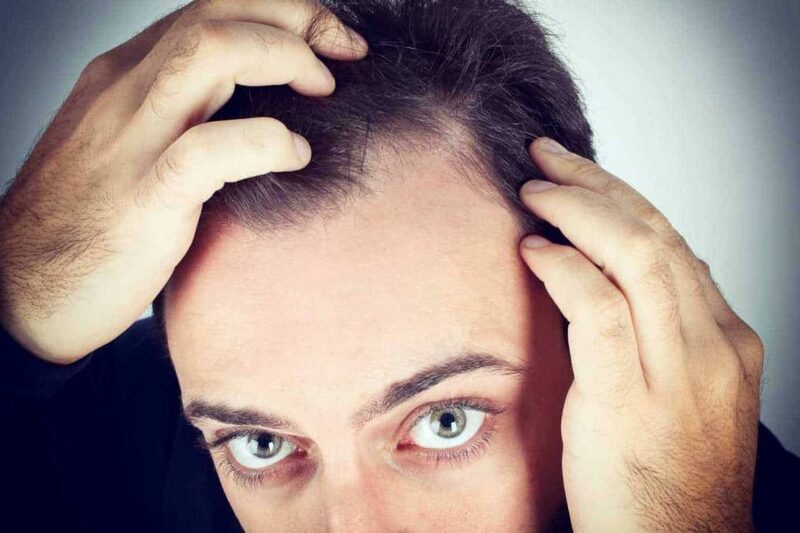 Even if there is no male-pattern baldness gene, this boost in hormones can still cause shrinkage of the hair follicles. According to the American Hair Loss Association, by the age of thirty-five, approximately two thirds of men will have lost a little hair. By the age of fifty, 85% will have experienced hair thinning or have lost a significant amount of hair. Whilst some women do experience hair loss early on in life, it is more common after the menopause, not because of an increase in testosterone but rather because they experience a drop in other hormone levels. And hair loss before the menopause is usually caused by a condition known as alopecia which can develop at any time and cause hair loss which may or may not be permanent. Often it is caused by stress and is not a common condition. Another reason why it appears men lose their hair more often that women is that it is much more obvious when a man begins to lose his hair. As previously mentioned, the characteristic hair loss pattern of male-pattern baldness is very obvious but when this process starts it is not usually a gradual process. When compared to how women lose their hair, all over the scalp at a slower rate so the appearance is one of thinning rather than loss, men tend to lose a lot of hair over a shorter period from the specific areas of the crown and the hair line. Why don’t all men experience rapid hair loss? Going back to the hormones theory, you may be wondering why all men don’t experience hair loss if they all produce testosterone and therefore, create the same testosterone by-product. This is thought to be down to the fact that some men create more than others, and some have more receptors than others. A man could make a lot of the hormones and still not experience significant hair loss if he only has a few of the receptors in his hair follicles. Also, not all men a prone to male-pattern baldness as this condition is usually passed on in the genes so man whose father suffers hair loss, is genetically predisposed to also experience it and is much more likely to lose their hair than a man whose father still has a full head of hair. Whilst some men are prone to losing more hair than others, there are a few things you can do to slow it down. One way is to avoid inflaming the hair follicles by over styling or applying chemicals regularly. This means no hair dye and heat damage! You can also help to assist good hair growth by eating a healthy, balanced diet. Make sure you are getting plenty of iron, zinc, Vitamin D, protein and omega-3 fatty acids from your food as they will aid hair growth and keep the hair follicles healthy. Of course, if you have already lost your hair, you may be looking for a solution to get it back. Hair loss surgery is the simple answer. Wimpole Clinic is one of the best-equipped and most surgically advanced hair transplant specialists in the UK. We can help you achieve fantastic results that help you to get your confidence back and feel good about yourself. Call us today to find out more.